COX-1 antibody LS-C14622 is an unconjugated mouse monoclonal antibody to COX-1 (PTGS1) from human, bovine, guinea pig and other species. Validated for ELISA and IHC. Recognizes sheep, bovine, guinea pig, rabbit and human PGHS. Does not react with rat, mouse or canine PGHS. 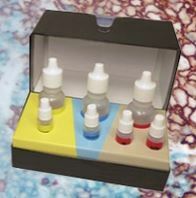 Suitable for use in ELISA and Immunohistochemistry. Short term 4°C, long term aliquot and store at -20°C, avoid freeze-thaw cycles.